Wow, summer went by so fast! Now the days are getting longer. You can start wearing layers again. You can actually open the window and feel some fresh air. And I am so excited because now I can enjoy soups again! This spicy pumpkin apple soup means instant coziness. It's perfect for a warm day in fall but also for a freezing cold winter day. I just came back from a weekend trip to Copenhagen (check out what I ate here) and what I absolutely loved was the coziness of the city. The Danish concept of hygge (aka getting cozy and comfortable) really fascinated me. First thing I did when I got back was to buy a blanket and a couple of candles (stereotypical, I know, don't judge me). Blankets and candles are one thing, but for me, food plays a huge role in feeling and getting cozy. There's nothing better than a warming porridge with peanut butter or a hearty stew on a cold day to warm you up from the inside. 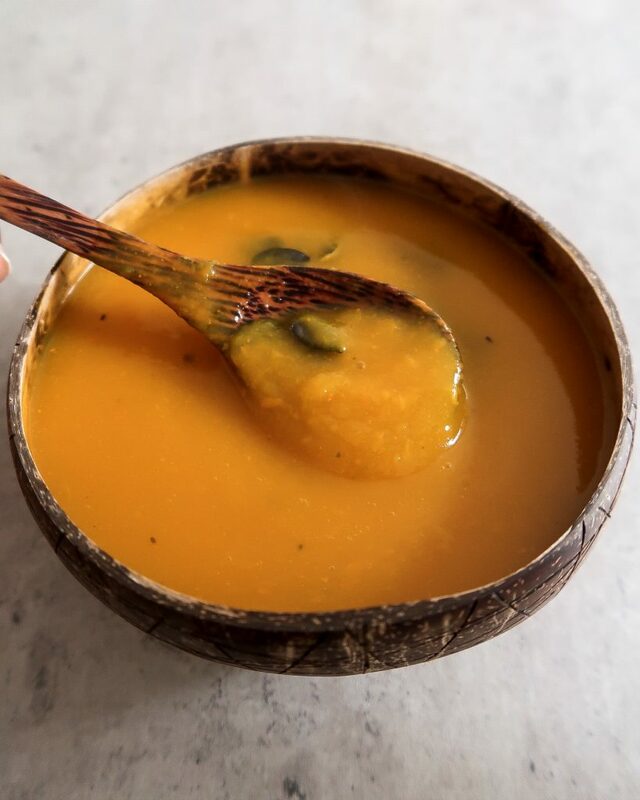 This pumpkin apple soup is the perfect meal if you want to feel cozy instantly. 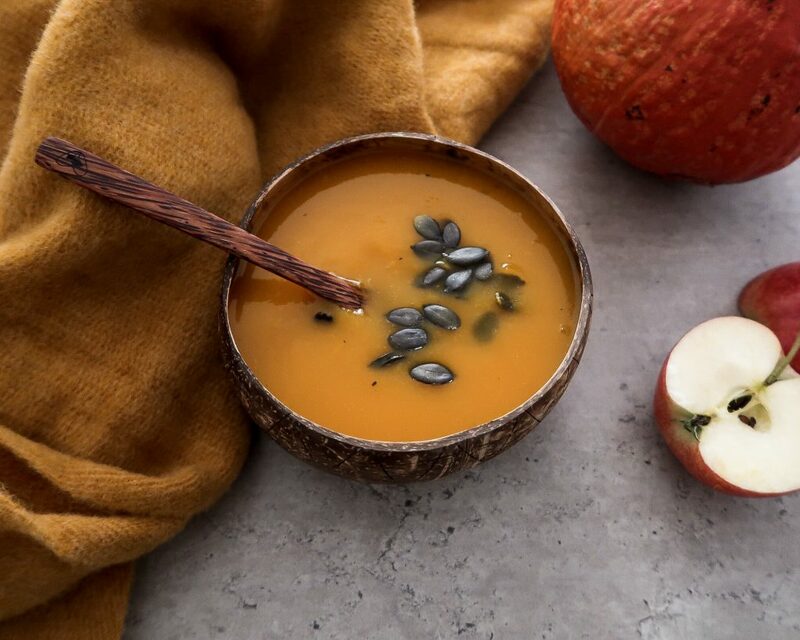 This pumpkin apple soup recipe is super easy. All you need to do is chop up the veggies and cook them until they start to become mushy. Then you blend everything with a hand blender and voilá - you're done. 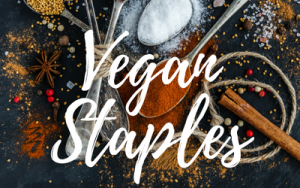 In this recipe I've used pumpkin, apples and carrots but you can totally add other veggies, too! If you have leftover potatoes, just throw them in as well. If you're feeling adventurous, you can even add pears! 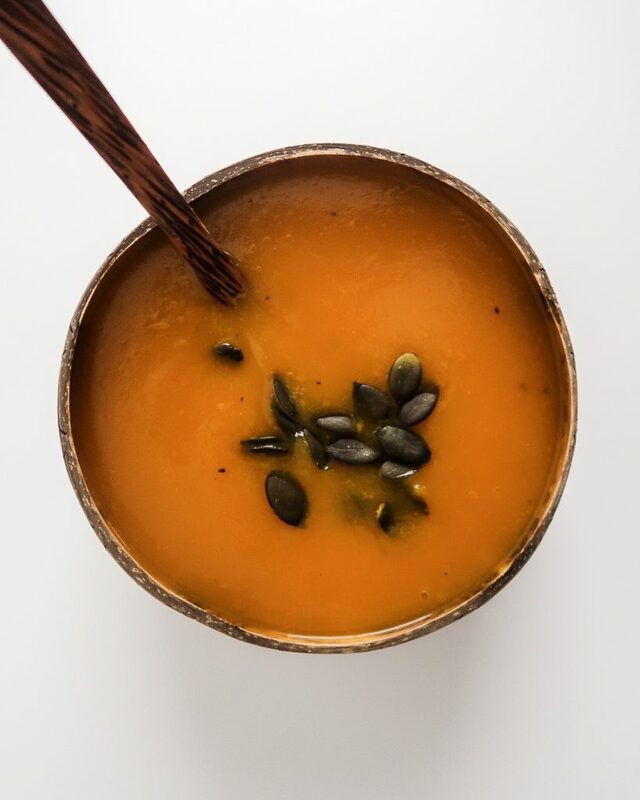 This pumpkin apple soup has a really nice spice to it. It comes from the ginger. You can easily adjust the spiciness by adding less or more ginger. I really like ginger to spice things because it is quite strong but not so strong that you have to cry from it. Ginger is an amazing food! No wonder you'll find a dozen different ginger teas in the supermarket. Ginger is anti-inflammatory and can help fight colds and the flu. Furthermore, it is said to help settle upset stomachs, nausea, vomiting and aids digestion. Peel the onion, garlic and ginger and cut into rough pieces. Add the onion, garlic and ginger to a large pot on medium-high heat. Add a splash of water and sauté for a couple of minutes. You might need to keep adding splashes of water so it doesn’t stick to the bottom of the pot. In the meantime, peel the carrots and wash the apple and pumpkin. 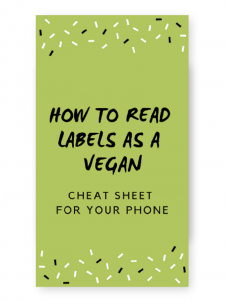 Cut into chunks. If you have an organic pumpkin, you can leave the skin on. Add the remaining vegetables to the pot and add vegetable stock until completely covered. Simmer on medium heat for ~15 minutes until the vegetables are tender. Let cool slightly, then puree with a hand blender. Season with salt and pepper. 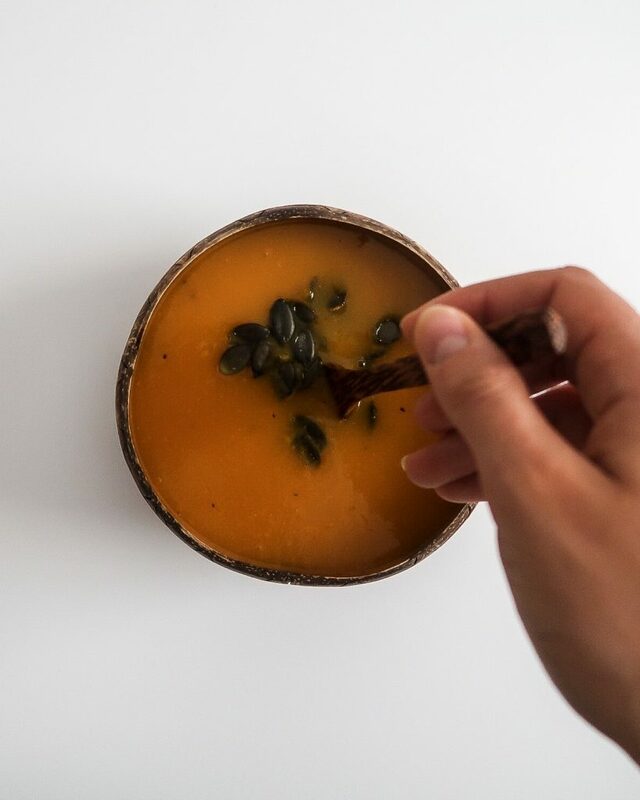 If necessary, briefly reheat the soup and then garnish with pumpkin seeds. 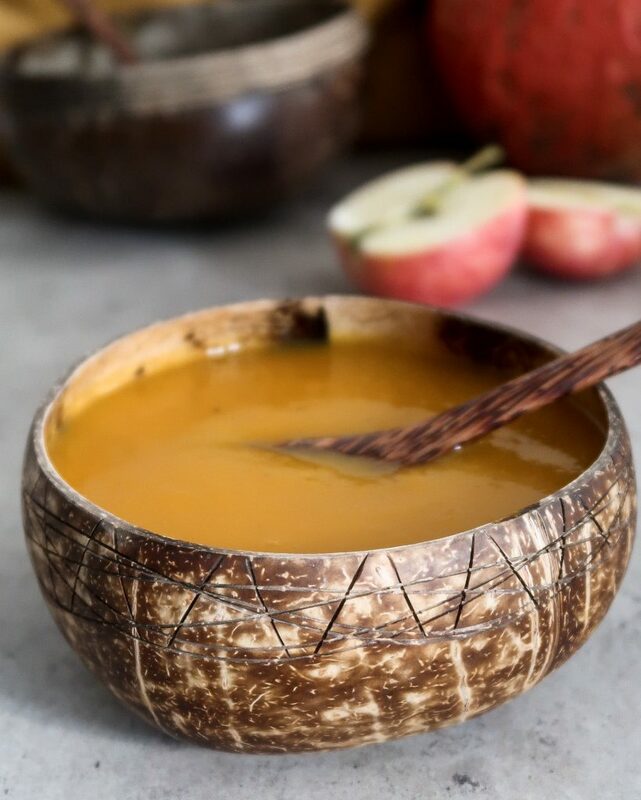 You can easily freeze this pumpkin apple soup up to a month or two. In fact, I find it tastes even better on the second day or frozen and thawed.